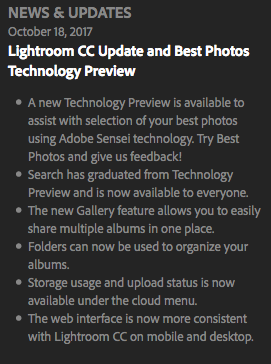 What are the criteria for “best photos” in Lightroom web‘s technology preview? The precise details aren’t published anywhere, and Adobe haven’t said much apart from saying that their Sensei artificial intelligence tool analyses images uploaded to LrMobile (see the FAQ if you want to opt out). But there’s plenty we can work out for ourselves! What I think one can see is that it groups photos shot at roughly the same time, and then looks for the best of each group using a range of criteria. User-entered data seems to rank highly, so I have series of almost-identical photos where Sensei always selected the photo which I had starred or flagged. After that we’re just guessing. Maybe it measures qualities like sharpness, and the algorithm could be flexed for any faces identified in a picture. I think I can also show that it includes conformity to composition concepts like the rule of thirds. Interesting though it is to make educated guesses, maybe we’d be better off asking how well it works? Does it automatically identify your best photos, and would that save you time? I don’t yet know for sure, but it’s certainly interesting as a preview. In this case Adobe’s Sensei artificial intelligence preferred the photo on the left. Apart from the car’s position everything else is the same in the two pictures and I hadn’t flagged or rated either one, so presumably Sensei chose the one closest to the rule of thirds or some other principle.